Two great quarter racer events are coming up in the Lansing area. You&apos;ve got to check it out - its racing at its mini-best. Want to do something really cool and different this weekend or next (or both?)? You&apos;ve got to check out the 2015 Quarter Midget Races in North Lansing. What is it? Well, the quick answer is little kids in little cars having a big time race. Maybe you need more information than that. A Quarter Midget car is a scaled-down version of an actual midget race car by approximately 1/4 scale, thus the name. 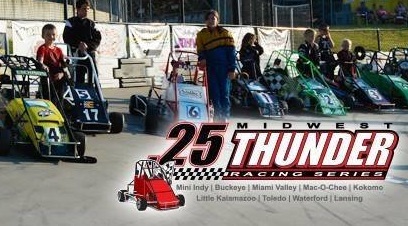 Quarter Midget Racing is a competitive sport for children between the ages of 5 16. However, the entire family is involved in putting on the race day activities. The race events are put on by the membership within the club. Quarter Midget racing is a family oriented sport that involves racing in specially prepared cars. The cars, rules and safety procedures are designed specifically for kids. They race on oval dirt and asphalt tracks approximately 1/20 of a mile. All cars and drivers equipment must conform to all national safety rules. Full roll cages, racing clothing, helmets, gloves, neck braces, safety belts, arm restraints, mechanical components, etc. are covered by National safety rules. The CAPITOL QUARTER MIDGET ASSOCIATION has existed in Lansing, Michigan since 1959. The Track is located behind Renos North Restaurant and Bar @ 16460 S Hwy 27, Lansing, Mi 48906. About 3 miles south of the I-69 and Old US-27 interchange. Or from Downtown Lansing, approximately 3 miles north on Larch Street also known as Business Route 27. Its a one-of-a-kind form of fast-paced entertainment and yes one can find it regularly right here in Greater Lansing. ADMISSION TO THE RACES IS ALWAYS FREE!! !